Marsh, James H.. "Lake Louise". The Canadian Encyclopedia, 04 March 2015, Historica Canada. 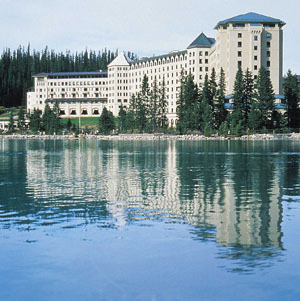 https://www.thecanadianencyclopedia.ca/en/article/lake-louise. Accessed 18 April 2019. Lake Louise, 2.4 km long, elevation 1731 m, is located in Banff National Park in southwestern Alberta. Lake Louise's outlet is a creek flowing into the Bow River. Lake Louise, 2.4 km long, elevation 1731 m, is located in Banff National Park in southwestern Alberta. Lake Louise's outlet is a creek flowing into the Bow River. 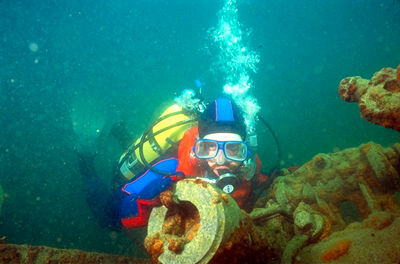 The Stoney called it Ho-run-num-nay meaning "lake of the little fishes" and it was a Stoney guide who took Canadian Pacific Railway (CPR) workman Tom Wilson to the site in 1882. Wilson named it Emerald Lake, but the name was changed (1884) to honour Princess Louise Caroline Alberta, fourth daughter of Queen Victoria and wife of Governor General the marquess of Lorne. The jewellike lake, framed by blue mountains and gleaming snowfields, is one of the most famous mountain vistas on the continent (Corel Professional Photos). Chateau Lake Louise in Lake Louise, Alberta (photo by John Dean, courtesy Take Stock Photography Inc.). Canada's highest community (at an elevation of 1540 m), also called Lake Louise, is near the lake. The resort community is on the site of the former CPR station, Laggan, which was base camp for 12 000 workers in 1884, when CPR construction proceeded through Kicking Horse Pass. The jewel like lake, framed by blue mountains and gleaming snowfields, is one of the most famous mountain vistas on the continent. 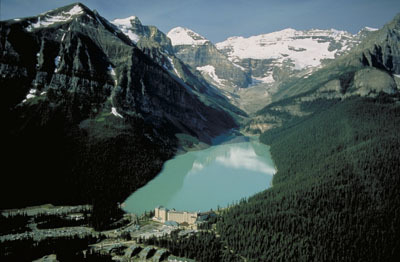 Chateau Lake Louise stands atop the huge glacial moraine that dams the lake.